White gravel roads. Vintage brakes. 28mm hand-sewn tires, and downtube shifters. Grey-haired old men in wool jerseys and goggles. Red wine and ribolita at rest stops. These are just some of the things that make Tuscany’s most iconic cycling event so memorable. João has called l’Eroica “the most fun he has ever had on a bicycle” and there’s a good reason; the spirit of the day is palpably festive, the roads historic, unforgiving and rewarding. Consider this an invitation to ride straight into cycling’s yesteryear – a kind of historical re-enactment that reveals the true nature of the sport in its glory days. 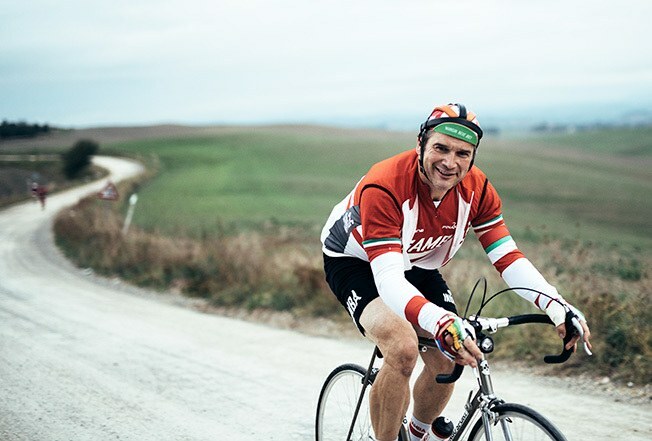 The world-renowned spectacle known as l’Eroica granfondo has come to be recognized as one of the most significant and unique cycling events in the world. All participants must ride a pre-1987 bicycle and are encouraged to wear vintage cycling gear. Every year, the event sells out in a heartbeat as Italians and foreigners alike scramble to secure their spot on the famed pre-dawn start line in Gaiole. Welcome to Italy! We always do the Monti loop as our first ride when we arrive in Lecchi after a long day of travel. This is a quintessentially Tuscan route that offers the perfect glimpse into the heart of the Chianti region, the birthplace of inGamba. As the late afternoon light gives a glow to the hillsides and the shadows lengthen, we will roll along ridge tops, through small villages where the locals wave as you go by, and past the ancient olive groves that blanket these fertile hillsides. This ride has one long, solid climb — which should shake out any cobwebs built up during your flight. After testing your Dogma — and your legs — on some shorter, but challenging climbs, we’ll stop for coffee in the small town of Panzano. Our ride today covers a large portion of the 2016 Giro d'Italia Individual Time Trial course, in reverse. Imagine how difficult it was for those guys to race these twists and turns with TT bikes in the cold rain. It was a tough day. Castello di Ama has been hailed as the “Ferrari of Chianti wines”, and our invitation there tonight will introduce the two core aspects of Ama: wine and art. Ama houses permanent installations from such renowned artists as Louise Bourgeois, Nedko Solakov and Kendell Geers. Following the tour we will dine in the private dining room of the estate and enjoy some of the best wines from the private collection. Today’s ride will take you south toward the town of Montalcino where the rolling Tuscan clay-colored views of postcards will be in full effect. This is the Crete Senesi, a region known for its production of white truffles. The highlight of our ride is the ridge south of Arbia. This afternoon we will visit Siena, one of Italy’s most visited cities, which has been declared a World Heritage site by UNESCO. The city has its roots in Etruscan times and is most known for the annual Palio horse race — which is run around the Piazza del Campo. It’s time for you and your bike to explore the beauty and brutality of Chianti’s mountains. Although the region is built on hilly terrain, today’s ride will include more sustained climbing. After reaching the town of Panzano we visited on Monday we will keep rolling through some tiny roads with great views to the north towards Florence. After a big climb (the cima coppi of the week) Enjoy the scenic long technical descent out of Albola: It will test even the most-experienced riders. Riding the first five days has taken you through deep forest with incredible panoramic views of undulating terrain. This morning we will climb toward the town of Radda before turning to Castellina. 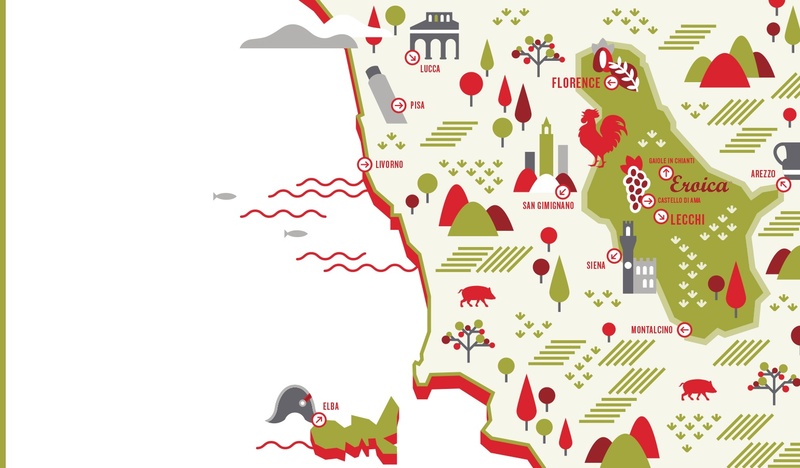 The earliest definition — in 1716 — of the wine area of Chianti, Lega del Chianti, is the region we explore on today’s ride. This will be a day of truly incredible views from the bike, especially after our left turn in the town of Colombiao at 55km. This evening we will gather once more in Borgolecchi for another meal around the table, but this is always the most special meal of the week: bistecca fiorentina. Welcome to the preparations for l’Eroica. By now you’ve seen our mechanics working late into the night to prepare the vintage steel sleds for tomorrow’s big day. Whether you are doing the 46km course, the 205km course, or something in between, we need to spend some time before l’Eroica learning how these bikes ride and how they handle on the gravel roads. Be gentle. Treat your vintage bike with care and the two of you will glide over the sharp rocks and potholes with ease. Steel frame bikes with downtube shifters and toe-clips is not what most people think of when they imagine a bicycle event. However, the pageantry and tradition are what make l’Eroica perhaps our favorite day of the year. We treasure these white roads and often take detours on regular rides to make sure we hit some of the sections. They are often the highlights for many of our guests since they can’t experience these roads at home. Today we have the opportunity to take part in the event that has become a cult following. Whichever distance you decide to do, it will surely become the memory of a lifetime. Today is a travel day. We will arrange your transportation to Florence in time for your flight home.